Our outstanding team, with decades of experience engineering barcode printers and a clear understanding of the marketplace, designed our performance solutions to exceed industry expectations. Our first thermal barcode model was developed to excel in the midrange arena. True workhorses of the industry, midrange printers are expected to perform effortlessly in some of the harshest of settings. So, we took every opportunity to ensure the Performance Series offers the features thermal printer users identified as most important. Straightforward integration is made possible with PCL5e. IT departments spend less time getting printers up and running and without the restrictions of proprietary languages, end users can take advantage of a plethora of application choices. Ease-of-use, the philosophy behind every midrange thermal barcode printer we build, inspired the series- auto media ID and constant ribbon tension features. Durability, in the form of die-cast aluminum construction and a high-quality print head design (with self-cleaning capabilities), ensures the longevity of ST Performance Series printers. - - Auto media load and calibration to give printer operators freedom from the time and complexity of media set up. 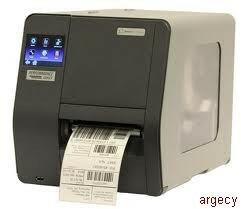 - - Real time clock ensures labels reflect the time they're printed and not just the time the print job was sent. - - Graphic color touchscreen display with truly intuitive menu flow makes navigation seamless. Our goal of bringing a superior product to market was realized with the introduction of the midrange ST Performance Series, engineered and assembled in the United States. This printer's industry leading design offers superior print quality with rugged reliability. The p1115 is built to maintain a high-level of performance and withstand the rigors of a harsh environment without sacrificing duty cycle.